An independent panel has found the State Department has not overall paid enough attention to oversees security for diplomatic posts and called for it to be elevated in importance, several sources familiar with the matter said. Led by former Secret Service Director Mark Sullivan, the panel was created as part of a broad inquiry of last September's deadly terror attack on the U.S. diplomatic compound in Benghazi, Libya. A separate assessment by the Accountability Review Board, established after the Benghazi attack, criticized the department for failing to provide adequate security and made 29 recommendations. One was the creation of the latest analysis to identify "best practices" in the public and private sectors in security intelligence, risk management and accountability, all areas where problems were identified at the State Department. The new 31-page report, described to CNN by several sources familiar with the contents, found the diplomatic security bureau to be lost in State Department bureaucracy as one of eleven functions overseen by an undersecretary for management, currently Patrick F. Kennedy. The findings do no not specifically address the State Department's handling of the attacks, but point to Kennedy's office for not paying enough attention to the diplomatic security bureau. It recommends creating new senior-level oversight "as a matter of urgency" to give security matters more of a priority at the top levels of the State Department. "The threats Foreign Service personnel face requires the department's security function not to be relegated to the same status as other important but distinctly different, support functions," the report said. "The department's present direction of expeditionary diplomacy, operating with an increasing number of temporary and permanent posts in complex, high-risk environments, requires an organizational paradigm change," it said. Alec Gerlach, a State Department spokesman, declined to comment on the findings because they had not been formally released. In the run up to the one-year anniversary of the Benghazi attacks on September 11, the State Department temporarily closed 19 and embassies and consulates across the Middle East and North Africa last month over a terrorist threat. The Bureau of Diplomatic Security was established by Congress in 1986 as part of legislation to increase security at diplomatic facilities after the bombing of the U.S. embassy and Marine barracks in Beirut three years earlier. The bureau's 2,000 special agents and other staff protect roughly 150,000 employees and family members. Three of the four employees removed from their posts and placed on administrative leave last December after the review board's report on Benghazi were from the diplomatic security bureau. Secretary of State John Kerry last month reinstated the officials to new jobs, which State Department officials said carry less responsibility. Last year, the State Department created a new position of deputy assistant secretary of state for high threat posts and has begun to beef up security at those facilities. But the panel's report found steps so far - including efforts to improve training, increase personnel, and outfit installations with new security technology - to be inadequate without establishing clear lines of authority and responsibility for diplomatic security. A new undersecretary, the report said, would be responsible for "conducting threat and vulnerability assessments to identify risk" and recommending safeguards. –CNN's Evan Perez and John King contributed to this report. Security? "What does it matter?" The Obama administration continues to hide on the issue of Benghazi. No one is willing to tell the truth, especially the President. 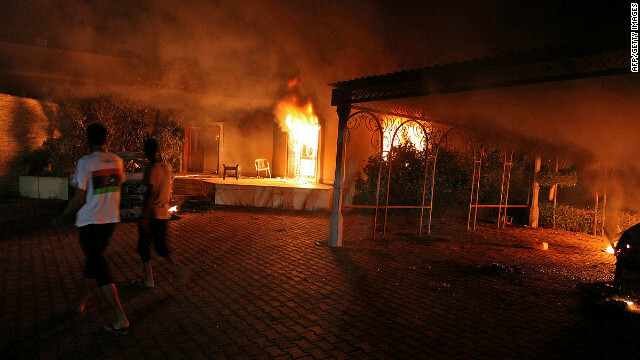 It has been reported that the only state department employee punished over Benghazi, was punished talking to Congress. No wonder no one is willing to come forward. Benghazi-Gate. The Obama administration lied and covered up. It's blatantly obvious. “…The findings do no not specifically address the State Department's handling of the attacks, but point to Kennedy's office for not paying enough attention to the diplomatic security bureau. Secretary of the State Department, John Kerry, would beg to differ. Translation: Benghazi and the death of four Americans is not a priority of the State Department and, therefore, unworthy of the time of day. more obama praise please ! That is very irresponsible to accuse Amb Stevens of being responsible for "his own demise." The only person(s) responsbile for this tragic event are the ones who carried out the attack that night. Yes, in retrospect it is easy to say that the State Department should have been more cautious with Amb Stevens placement, but we (the public) are not privy to all of the variables that contributed to him being in Benghazi that night. This event by all means should be an eye opener as we move forward, we need to continously be self-critical of our security practices and also focus on not becoming complacent as time goes on. I have had enough of all these finger pointing theories! Amb. Stevens was in Benghazi for what reason? This we are not told. If he felt insecure he should have returned immediately to Tripoli. He did not! Only Stevens can be held accountable for his own demise! Obviously, he was there for reasons no one is willing to say! He was very foolish to be there on the anniversary of 9/11. One ambassador killed for no reason! He was up to no good! Stan, it actually came out a couple of months ago that the building that was attacked was a CIA operations house. What exactly was going on is still a highly guarded secret. The report said there were between 20-30 CIA operatives there that night, and 3 of the 4 killed were CIA in some regard. My intiail anger over the incident was because there are always US Marines guarding our embasies. Then it came out, it wasn't an embasy at all. Then it came out it was a CIA op gone bad. Dont listen to the hateful types posting here, they just wan to pin something on Mrs Clinton they fear her tremendously.